Last we checked: being in two places at once is kind of impossible. Which can be kind of inconvenient when, say, you’re looking to check out ski conditions in Tahoe. And you’re at Game 1. This will help: Tahoetopia, an app employing webcams, videos and Doppler radar to keep you posted on what’s happening snow-wise in Tahoe, available to download now. Okay, so things don’t really get started up there for another few weeks, but since they got their first snowfall yesterday... we didn’t want to sit on this one. This thing will be of use whenever you need up-to-the-minute updates on slope conditions at Squaw and Northstar. (So basically, now through spring.) Using the app’s dashboard, you can employ custom satellite and radar imagery to watch the next storm blow in—or just check each resort’s snow reports. 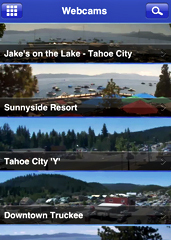 You can also live vicariously through Tahoe TV’s YouTube videos and real-time locals’ feeds. But the app will also come in handy on the mountain. Like when you’re on a chairlift at Northstar and wondering how conditions are at Squaw. Just fire up this thing, hit “Webcams” (it has what they’re calling Tahoe’s most comprehensive collection of live webcams) and scroll to find the locale you’re most interested in—perhaps the live HD-screening webcam at Squaw Valley Uber Cam. You haven’t seen snow until you’ve seen it in HD.